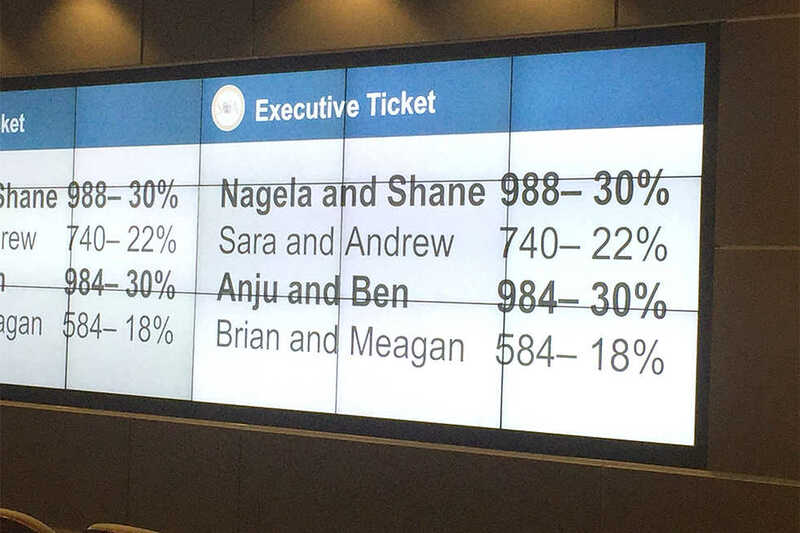 After nearly a week of voting, the election for Undergraduate Student Government Association (SGA) Executive has entered a runoff race between Nagela Nukuna/Shane Mudrinich and Anju Suresh/Ben Nickel. Nukuna and Mudrinich received 988 votes and 30 percent of the voters. Suresh and Nickel received 984 votes, also amounting to approximately 30 percent of the vote. Sara Dada and Andrew Perry received 740 votes, while Brian Shin and Megan Fechter received 584 votes — calculating to about 22 and 18 percent of the vote, respectively. 3,296 undergraduate students voted in this phase of voting, which entails a turnout rate of approximately 21.76 percent. The remaining candidates immediately entered a second stage of campaigning upon the announcement of the runoff on April 13 during a 6 P.M. presentation in the Bill Moore Success Center’s Clary Theater. “In retrospect, Megan and I needed this campaign. It gave us a chance to rekindle our passion for the student body and examine ways to better love this campus with conviction. We consider ourselves incredibly blessed for the opportunity to meet so many new faces and to publicly celebrate the beautiful diversity, curiosity and generosity that is living and breathing throughout our Institute. “So thank you Georgia Tech for affording us this opportunity to serve, love and be loved. We may have lost the election, but there is a victory within the lessons we have learned that have shaped us into who we are today. “We are, of course, disappointed,” said Sara Dada on behalf of her campaign with Andrew Perry. “But we know that we will continue to strive towards making a positive culture change on campus and continue to work on some of the initiatives we laid out in our platform. “We love Georgia Tech, and we are thankful for the opportunity we had to share our vision with the student body, to meet with student organizations that had never been approached by SGA before and to learn so much about our Institute. “Thank you so much to our campaign team and everyone that supported and believed in us — your faith in our vision was incredible and we are excited to keep working alongside of you. “We’re incredibly honored and excited to be given the opportunity to reengage with you all as we re­launch our campaign and rev up for runoffs!” said Anju Suresh on behalf of she and Ben Nickel. “Shane [Mudrinich] and I are ecstatic to be in the runoff period,” said Nagela Nukuna on behalf of her campaign. “We are humbled, yet inspired, by the other teams that truly have done a fantastic job. Especially now, we know that every single vote counts and will be the difference in this election. “We are re-invigorated and are so thankful for all the support we’ve received thus far! The last time these elections went to a runoff race was in 2009, when Alina Staskevicius beat Kristie Champlin after receiving 42 percent — but not a majority — of the initial vote. In that race, the turnout for the runoff race ended up being approximately 77 percent of the original turnout. 2009 was, additionally, the third straight year that went to a runoff. In 2009 and 2008, the candidate who won the runoff had over 40 percent of the vote in the initial phase; in 2007, the candidate who initially had a lead of 600 votes ended up losing in a runoff by 500 votes. Elections in recent years have been landslides, with the exception of 2015, in which Jen Abrams and Jefferson Losse won approximately 51 percent of the vote and just cleared the 50 percent margin required to win the majority. Online polls will open again on Friday, April 15, at 1 p.m., once again on the SGA elections website. Polls will close at 4 p.m. on Tuesday, April 19. The winners will be announced at the SGA Office in the Student Center at 6 p.m. that same day.